Dairy farming isn't something that one would normally associate with anime and manga, especially as there's nothing really entertaining about looking after or milking cows. There is, however, a rather improbable connection between these seemingly disparate industries, and nowhere is this more apparent than when dealing with popular franchises - like Full Metal Alchemist. With a successful manga, two anime adaptations, two movies, six light novels, two series of drama CD's, around a dozen video games across several formats, and a mountain of merchandise ranging from art books to key chains, Arakawa Hiromu's tale of two brothers is undoubtedly one of the most profitable titles of recent years. That said, the jewel in Bones' crown does lack the marketing clout of long-running franchises like One Piece, Bleach and Naruto, and in order to maximise profits the studio has decided to follow a tried and tested method to "advertise" the main series. Which is a much nicer way of saying that Full Metal Alchemist is the prize cow, and Bones have decided to milk it (again). The movie opens with a girl dreaming of her past, in particular the moment when a group of soldiers take her and her family away from what looks like a refugee camp. She wakes up to find her brother studying their parent's alchemy research book, but before she can go to bed the siblings hear a strange noise inside the house. Her brother goes to investigate but she secretly follows, only to witness a nightmarish scene that causes her to pass out. Several years later Central city, the capital of Amestris, is rocked by a prison break on the day of the harvest festival, and a confrontation with an escaping convict leads the Elric brothers on to another adventure. Okay, it all sounds pretty straightforward, and therein lies one of the main problems with this addition to the Full Metal Alchemist franchise. The overly linear plot and the fact that this is nothing more than another tale about a specific ancient power mean that the storyline is highly predictable - even though the feature is set in a new country with its own history. In addition to this there's a fairly noticeable lack of cohesion with the sequence of events, which may be due to the speed at which the narrative progresses. In order to fit the entire storyline into 110 minutes certain corners needed to be cut, but this has been done with very little care so things can often get a little ... disjointed. Aside from the over-churned plot, The Sacred Star of Milkos - sorry, Milos - also suffers from a similar "anime-by-numbers" methodology that was prevalent in Guilty Crown, and this becomes obvious when one considers the relevance of characters like Roy Mustang, Riza Hawkeye, and even Winry Rockbell. It's likely that their presence is nothing more than a nod to the fans as their addition adds nothing to the narrative, and this only serves to highlight the fact that this movie has been made for one reason only - and that isn't to tell a story. Visually this is a bit of a departure from the clean lines and smooth animation that one might expect of the franchise, and the techniques used during action set-pieces have an experimental feel. That said, the detailed artwork lacks the finesse of Brotherhood, and while the character designs are pretty much what one might expect, the movie has a rushed atmosphere that no amount of familiarity can counter. This is reflected by the quality of the animation the attempts to make the action scenes more visceral often has bodies contorting in odd ways. The experimental nature of the visuals also makes the CG stand out, and the obvious disparity can make certain scenes look more than a little odd. The movie does have an opening theme, but viewers will have to wait ten minutes before they can listen to Miwa's dulcet tones as she sings "Chasing Hearts", a pleasant rock-pop song with an adventurous atmosphere which unfortunately has been relegated to background music for the on-screen action. The Sacred Star of Milos closes with a rather simple sequence depicting a train journey across various landscapes while L'Arc-en-Ciel's serenade viewers with their fourth contribution to the franchise - an upbeat rock ballad called "Good Luck My Way". The rest of the movie has a variety of musical accompaniments composed by Iwashiro Taro ranging from dramatic martial themes to medieval-style ditties and mysterious piano pieces, and for the most part these tracks fit their respective scenes quite well. Sadly, the movie suffers from the poor scripting that has plagued many shounen titles over the years, and although the actors are as competent as ever, not even their vaunted skills can do much with the typical formula of cheese, shout, run, hit people, shout louder, more cheese, run faster, scream, hit more people, etc, etc. The rather pedestrian dialogue means that The Sacred Star of Milos lacks the emotional charge of its predecessor - a fact that is borne out by the predominantly static characters. The problem is that this movie is little more than a sideshow rather than a main event, which ironically places this feature below the much maligned Conqueror of Shamballa in terms of development - especially where the Elric Brothers are concerned. The only character who shows any sign of growth is the main heroine - Julia Crichton - but this alone cannot support the weight of a story that relies on previous familiarity with specific characters. While this method of storytelling isn't necessarily a bad thing, it does place limitations on the storyline regarding the actions of particular individuals, and when one adds the fact that several characters are nothing more than window dressing, viewers may find themselves disappointed with the overall lack of depth. That said, although this addition to the Full Metal Alchemist franchise has more moo than milk, fans will probably find themselves warming to it as it offers them a chance to see the Elric Brothers in action once more. The feature may not be of the same standard as Brotherhood, the original anime adaptation, or even the first movie, but it does offer some moments of pure enjoyment. Although the storyline is relatively simplistic compared to what has gone before, anyone familiar with the franchise will probably find this an easy film to watch - even with the blatant and somewhat redundant reminders of certain past events. It's just a little sad that a great title is being treated as nothing more than a cash cow, but with The Sacred Star of Milos, hopefully Bones will decide it's time to put the franchise out to pasture. Anyone who has seen the trailer or was looking forward to this film should know that this was filler, me included. However, it's still Fullmetal Alchemist (FMA) so while I wasn't looking forward to this as much as other things, I still would've seen it as soon as it was released. I wasn't aware of the runtime (2 hours) until before I saw the film. I generally don't care for films this long but I had some faith simply because it was FMA and the franchise hasn't let me down... until now. Story: Generally in films based on something, they want to broaden their audience by giving a little background on the characters and why they do what they do. If this film was someone's first Fullmetal Alchemist experience, knowing what it's about might help guide them into the story. Unfortunately, for those who do know about FMA, there might've been a tad too much for my liking. Beyond that the actual story is pretty generic and not very interesting. There wasn't anything to hook me in and it's a story that's been done to death. So I understand giving background for the newer audience but they really should've considered the people that FMA has already roped in. What lead up to the climax is boring... I was waiting quite a while for the plot to kick in and it was maybe halfway in that relevant things started to happen, though I still didn't care enough. Let's talk about the actual story now. Or, you can just look at the themes that FMA has previously explored and watch/read that again. This is one of the major problems with the film. As a FMA fan, this is nothing new. Even in general, this is nothing we haven't seen before. There are some people being oppressed by the military and they're forced to live in fear under terrible conditions. Not too different from the Ishbalans. The greedy bad guys want the Philosopher's Stone for monies and to make the world into what they feel is a better place. It's up to our heroes to stop them. "Classic filler plot" basically sums up the story to be honest. The plot itself is pretty straightforward barring a few twists that I'm sure many won't see coming. The biggest "facepalm moment" for me was the end of the final fight. One of the most random "because the plot required it"/deus ex machina moments I've seen in a while. More on that later though. Watching how they fight and how it ended really bothered me. There were also plenty of "Oh, that's convenient" moments throughout the film and unfortunately, they're pretty in your face. I was near insulted at how "subtle" they were about them too. I'd like to share them with you but you know, spoilers. Even if you're new to FMA but not new to movie cliches, you shouldn't find this to be a great piece of work. If you didn't care about this story though, I still hope it gets you to check out previous works because those are genuinely good and still hold up. Art: A little aside for a moment. Compared to Brotherhood, I liked the art for the original series better since they looked more straightforward for lack of a better term. There wasn't anything too strange or different about the way they looked. The faces of the characters looked "sharper" and I was okay with that. I know that both FMA and Brotherhood were made by the same studio and that for Brotherhood, they wanted to mimic the Manga's art style. I can respect that and have no problem with it as they were making faithfulness a priority in both art style and story (Seriously, lots of respect from me here). I suppose I was just used to the first FMA because it came first and I liked it so much. On the other hand, for both series the animation was fantastic. Things looked good as they happened and the characters were animated very well with little or no loss in art quality. For this film however, I think the art suffered a lot at times. Sometimes the faces of characters simply looked awful. Most of the time, it was fine but you can tell when the quality goes down. There's just this inconsistency that keeps coming up. I would expect more from a movie budget. On the other hand, the animation was just okay. Considering the quick chimeras they fight at some points of the film, the fast movements looked well done and exciting. The train fight was very well done and really one of the few highlights of the movie. What I definitely wasn't a fan of, were the Gurren Lagann shots during fights. If that wasn't a proper screenshot of what I'm talking about but you've seen Gurren Lagann, then you know what I'm talking about. Plenty of shows have utilized this animation style. The movement might look okay but the art suffers tremendously and I don't understand why it has to be this way. I suppose the guys doing it like it but I really didn't care for it at all as it was quite distracting. It felt out of place when used and I didn't want to be reminded of Gurren Lagann when I'm watching FMA. Sound: I can't comment much on the music. While I was watching it, nothing in the soundtrack stood out to me. I also didn't have an urge to track down the opening or ending song. Just going to give them the benefit of the doubt here since I can't judge this area fairly. The voice acting is fine (Watched the Japanese version) since it's the same cast as FMA Brotherhood and I don't think anyone could find them awful after so many performances. The two filler mains have pretty famous voice actors behind them and I was surprised to later find out who they were. For me, they don't bring in a performance that wowed me but they were fine for the roles they played. Not annoying or horrendous to listen to so I'm good here. Character: Why were any of the FMA cast even in this film? If you took them out of it and rewrite just a tiny bit the plot could honestly still resolve the same way. I'm all for giving attention to filler characters so they aren't just throw-away one-shots we don't care about but there's no reason to sideline the franchise's actual stars to do so. Ed and Al play the voice of reason in opposing the use of the Philosopher's Stone but really, anybody could've taken this role. Unfortunately, at the end Ed also has to give heroic speech #2148 while fighting the main villain. I'm reminded of all the times that Naruto and Ichigo have to spend time going through a heroic monologue in the middle of a major fight. FMA is better than this. Winry - I have nothing against Winry but she didn't need to be here at all other than because the writers/plot required it. If you're going to use Winry, make her do something other than fix Ed's arm during a fight. That's all she does here. If the writers didn't make Ed's arm break, she had no business being in this film. We don't need Ed's arm to break to indicate that the villain is strong. In FMA and Brotherhood, her character had things to do other than being a mechanic and that's what made her different from the usual useless female that's just in the show. Here, she's written into the film purely as a fanservice. Roy - I'm pissed. If there's going to be any bias from me, it's here. To start, he shows up early on in the film so they establish that he's there. Great, now I have something to look forward to. Guess what? He doesn't do anything. He shows up at the final fight, I see him put on his gloves and I'm like "This is it!". He doesn't even participate... All that happens is that after Ed fights the villain a little, they cut to Mustang with some burned chimera on the floor who at this point aren't even a threat. They didn't even show Roy taking them out. It all happened offscreen. What. The. Hell. Despite my dislike of why Winry was in the film, her fixing Ed's conveniently broken arm was far more than anything Mustang did in the whole film. When Mustang showed up in Conqueror of Shamballa, that was a big highlight for many. He did plenty to help and that was great. He had a place in the film because he did what soldiers with guns couldn't do, blow stuff up. And really, in a filler film where they have freedom with the characters, that's not too much to ask for. If you're going to put them in, make them do something. Everyone else - Armstrong makes a cameo just to whisper something in Mustang's ear, useless. Hawkeye has one bad "comedic" gun scene, useless. That's pretty much it for the characters we know and love. Anyone new to FMA would have no idea the importance of these four characters in the original story. As much as I like these characters, if they were going to be treated like this, I would rather they not be in the film at all. It would honestly be for the good of the film since whoever decided to make these choices with the characters obviously didn't care, so why were they in it? I went into the screening not too excited but knowing that these guys were in it raised some expectations which weren't met in the slightest. I'm pretty sure I'm not in the minority on this. I didn't care about the filler characters overall but I guess I should I talk about the obligatory female guest st- I mean main character. I'm sure many who see this find her to be a good character and all but I'm not a fan. Sure, she had some moments that one might classify as badass but I question a lot of her decisions. Her main goal is to save her people from the military using the Philosopher's Stone despite Ed and Al's objections that getting involved with the Stone is a no-no. Real-life examples right in front of her with how they messed up their bodies. This becomes a matter of temptation, a major theme in the FMA universe sprinkled all across the series. Later, she gets the Philosopher's Stone (not really a spoiler, you know the stone's going to come up) after watching the villain keep it in his hand to amplify his alchemic abilities. What does she decide to do? Does she decide to not use it, toss it to Ed and learn a lesson about fighting temptation? Does she do that? No, she eats it... which when done previously by other characters in the main series causes them to vomit and stuff. Good thing the plot conveniently doesn't let that happen here. There is no way she would know that eating it is any better than keeping it in hand like the villain did. Anyway, she participates in a crossfire of alchemic beams with the villain which is reminiscent of the final scene when Gohan was fighting Ce- Wait a minute, that's not how they usually fight in FMA at all. In FMA, fights are generally decided by skill and wits, not clashing alchemic beams... Then she wins thanks to [insert generic kizuna/nakama/main character power] reason. Not because of any well thought out reason, just another cliche. The end of the film results in her using the Stone to save her people and etc. with an overall minimal cost compared to the payoff. So, what lesson did we learn? Don't listen to warnings and do whatever? Using this character they have spit on a pretty crucial theme in FMA and that bothers me because I feel FMA is smarter than this. They're pretty in your face with who the bad guys are. One of the military guys looked like FMA's Yoki, stroking his thin upper lip hair. I wonder if he was a villain? Then, if we didn't already know the FMA military was corrupt, they shove it in your face. Including the Yoki guy, the military is once again keeping people down. This plot has been done to death. Where's the effort? The motivations for the valley people to do what they do is understandable as they're living under the military's control but again, I've seen this a million times so I could care less. Some of the villagers die during parts of the movie, maybe one or two with names. They have a cremation and such but I felt like the plot was revolved around them to make the audience feel sad and sorry for these near nameless characters. Offscreen deaths of characters who aren't established properly or named for the most part aren't going to make me care any more than when a Jedi Council member died in Star Wars Revenge of the Sith. Enjoyment: Not much. I was expecting something while sitting through the exposition and boring scenes and I got nothing. One of my friends fell asleep. I am severely disappointed and I hope that this will be the last one they make unless the original author writes it or the people who pitch it actually care about what they're working with. Conqueror of Shamballa was not much better but it was far better than this. Lesser of two evils since I can sit through that one again. I'll probably never watch this film again unless I was going to make a commentary/parody of it. Whoever was in charge of this film forgot why people like FMA: the well-done and unique story, smart and memorable characters, and their interactions. I usually hate character fanservice and pandering to the audience but this film REALLY needed some. If there was some effort put into writing a good story like we're used to in FMA, I wouldn't be asking otherwise. In this case however, having Mustang and Armstrong blow stuff up would've been more than welcome despite being shameless. I'm not asking for these two to take down the main villain but even a little more than what we got would've been nice. FMA has such a colorful cast of characters and they're side characters in their own film. I could easily come up with ideas for a FMA film if it had to be filler. Why couldn't we get a look at Xing? As far as I know, we've never seen the place and those characters made a big impact in the main story. Make one of the clans corrupt if you need an enemy. No different from the usual making of filler villains. The Xing characters have their share of fans so this could be a draw for people to see the film. Since they already established things for an epilogue at the end of Brotherhood, let's see it through. It would be interesting to see how our heroes now spend their days. Or make the story take place before Hughes died. I would've loved to see more Hughes. Are these the best ideas? No. Will there still be some cliches? Probably, but the point is these premises are interesting and have qualities to draw people in. The trailer didn't really have any "awesome" to point out. I'm sure everyone has their share of ideas that would beat this no contest. Filler doesn't have to be bad, especially if you have good characters to carry it. Since this film had to be filler, they had a lot of freedom and they just didn't care, much like Naruto and Bleach fillers/movies. I'm hoping FMA doesn't become one of the many franchises that will continue to be exploited for no reason other than because we can and monies. If they stopped making FMA after Brotherhood, I'd be okay with that as a fan because it had a good run. Brotherhood should be remembered as a well done story and a very faithful adaptation where the effort was clearly seen, something that doesn't come up often these days in Anime adaptations. This is a blatant blemish on an otherwise good record like Cars 2 for Pixar. Was there anything I liked about the film? At best I thought the train fight at the beginning was exciting and well done. That's about it. I would like to think that the film had potential if it was handled better and there are so many easy ways to improve it. It just unfortunately falls flat and rolls into a lump of cliches which the film could do without if a little thought was put into it. A couple of the twists I can see many people not expecting which might be fun for them but unfortunately, I could predict a lot of them. If you have a masked guy that only shows up for a movie with a self-contained cast, you're going to guess who he is. Unless, well... this. Overall: I cannot believe that this is close to surpassing Conqueror of Shamballa while there still isn't a home release. I am hoping that when this film gets a wide release, everyone will see how bad it is. Mustang bias aside, you can't include these great characters in a film, not do anything with them and expect fans to be silent. I don't use the word often, but these guys must be trolls. Check out this interview with the director. He didn't give anything close to a response about Mustang's "involvement". It seemed like an obvious thing to him that fans would be mad about everything that Mustang didn't get to do. He doesn't even TRY to explain himself. All he does is dodge the question by telling us something obvious. When asked about other FMA countries and the manga's ending, he just dodges it by saying that's the original creator's department. What?! Ask the author? No, we're asking YOU. Did you really think that those wouldn't be good ideas for a filler story? If he at least said that the creator wouldn't let them use those, fine but that's not what happened at all so guess who I'm not siding with? According to Anime News Network, the guy who wrote the screenplay has only previously worked on Doraemon. Come on... is that the guy who you'd count on to write an FMA film following the quality of Brotherhood? Let me just say I have nothing against the guy but it does seem to be a questionable choice when the only other Anime he's worked on was Doraemon. At least we learn from the link that FMA's creator had nothing to do with the story. I would feel even worse if she did and lose a lot of respect for her. Unfortunately, I cannot recommend this film to anyone, not even FMA fans. It was a big letdown but I'm sure dvd sales and box office will be as good as ever so the movie makers won't care. But if you haven't seen/read anything FMA before, check out anything else besides this movie. FMA is something that can easily stand the test of time and is much better than a lot of things being put out these days. As a fan of FMA I wanted to give my honest thoughts about the film because I walked out of it disappointed and mad. Again, one of the people I saw this with fell asleep... 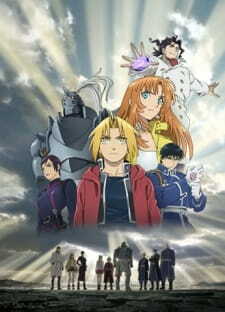 The plot holes, repetitiveness/reuse of plotlines, boring and cliche story, villains with no dimension, blatant ignoring of actual FMA characters who were in the film anyway for no reason, unnecessarily random and over the top "gore" scene, unreasonable runtime for what's in the film, and lack of FMA-ness killed it for me. It just didn't bring anything new to the table because while cliche stories can be done well or presented in a new way, that didn't happen here. It's all about the execution guys. Thanks for reading my review. I know this was a long one. I would appreciate feedback if you have any. An unfortunate truth about the anime industry is that movies of long-running shounen manga are always trite and unremarkable: uninspired scenarios and forgettable guest characters being among the main reasons why. Though it's not surprising. Why bother thinking up an interesting plot when you know people will be drawn to the popular brand it's based on anyhow? ''Full Metal Alchemist: The Sacred Star of Milos'' – based on the acclaimed manga - is no exception. It's a forgettable if somewhat serviceable adventure flick with some exciting action sequences and a lacking story. No different from the dozens of other films of this type. It's a shame, considering the plot showed promise; but it's all pulled off too clumsily to ever turn into a satisfying experience. The biggest problem is that the writing is sloppy. The guest stars (ie. characters exclusive to the movie) and central conflict are introduced in a hasty manner. The main antagonists in particular are too vaguely established to ever feel like a genuine threat, and that's not getting into the fact that some of their actions end up feeling counterproductive or that there's nothing stopping them before the Elric brothers arrive. Speaking of which, those two really feel like empty shells of themselves. Al feels more like a living plot device while Ed is relegated to being a generic action hero. Worse yet is that they shoehorn in fan favorites like Roy Mustang and Riza Hawkeye only to have their involvement amount to nothing. What the hell, Bones? Meanwhile, the more successful elements (like the interesting setting) are underdeveloped or feel repackaged from the main series. The one exception being female lead Julia Crichton, who consistently plays an active role and has a solid character arc that mirrors the Elrics' in a cool manner. Other positives are that the movie is solid in the audiovisual department. Though the offbeat animation style during fight scenes (reminiscent of ''Gurren Lagann'' and ''Tetsuwan Birdy Decode'') might rub some people the wrong way. There's also a conspicuous amount of still frames for an anime movie, though that's probably the price to be paid for going all-out during the elaborate action sequences. Despite some good points, ''The Sacred Star of Milos'' is simply lacking when compared to its pedigree. Full Metal Alchemist has, in all its incarnations, garnered a large following because it's always pushed the envelope for what a fighting shounen can be. This film simply can't match up to that legacy. Prequels and sequels are known to be tough to do well. They're dependent on and constrained by the original work (because of 'Fate/ Stay Night', we all know that certain characters in 'Fate Zero' have invulnerable plot armor). Still, there have been examples of such works that earn high critical praise. However, there is a third type of '-quel', the 'Interquel'- a story that takes place during an existing story. To my knowledge this type of story has NEVER produced an exceptional work. Not even Fullmetal Alchemist, though 'Sacred Star' does make for a decent time for existing FMA fans. 'Sacred Star' is set during the 'Brotherhood' storyline, but feels like it came out of the original anime- for all the wrong reasons. The plot is basically a movie length version of "The Elrics find a lead on the Philosopher's Stone, investigate, and it turns out to not be the real thing". There must be at least half a dozen filler episodes in the original anime that have the same story. Now, the story isn't all bad, we do get some cool world building that existing FMA fans will enjoy, and even if you can see the twists coming the journey is enjoyable just because we get to head back to Amestris one more time. The great downfall of any 'Interquel' is that it categorically CANNOT do anything that would disrupt the main plot, so there are limits to how big the consequences of any action can be (come on, we all know going in that the Elrics aren't going to find something that will get them their bodies back). Little to say here. The animation production values are decent for a movie-length release, and sound is fine with the same voice actors reprising their roles from the main series. The art style is slightly different from 'Brotherhood', but that's not a plus or minus. We already know the main cast, and they stick to their established personas, so no harm no foul. The new characters Ed and Al meet are interesting enough, but not to the point that I wish could see lots more of them. There is some exploration of what it's like to be a small people group caught between two large and powerful nations, but not to any truly deep level. Being an interquel, the main characters are static- character development is strictly for the main storyline. As a FMA fan, I did enjoy getting to see the Brothers in action again, but I was also able to predict the plot long before it happened. New FMA fans probably won't see what all the fuss is over if this is their first look into the franchise. Treat 'Sacred Star' as a little diversion and you'll enjoy it well enough. 'The Sacred Star' is not a bad movie, but it's not truly a good movie either. It's a movie-length filler episode with some good production values and cool world building. Enjoyable if you need more FMA in your life, but hardly the defining work of the franchise.